Traditionally used for bacterial and viral upper respiratory tract infections. As an auxiliary in recurring upper respiratory tract infections and other conditions of reduced immunity diagnosed by a doctor after a consultation. 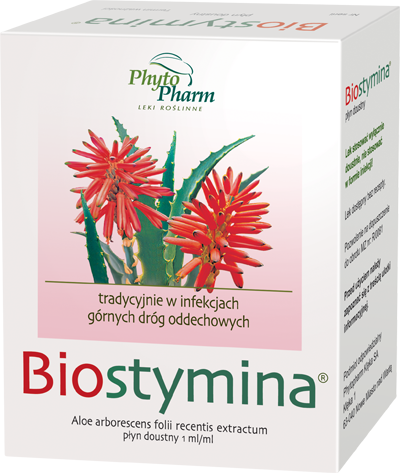 Medicine composition equivalent to 1 ampule (1 ml): the active ingredient of the medicine is liquid extract from fresh leaves of aloe arborescens (Aloe arborescense folium recens extractum fluidum) (1:4) – 1 ml. Other ingredients (excipients): the medicine does not contain any additional substances. if the patient has been diagnosed with progressive systemic diseases: leukaemia, collagenosis, tuberculosis, proliferative diseases, and autoimmune diseases. Children under 5 years of age: not recommended. Treatment cycle duration: 10–20 days; if necessary, repeat the treatment once after a four-week break. Do not store the ampoules after opening. The precipitate that forms does not affect the preparation activity. Before use, read the package insert, which contains indications, contraindications, information on adverse drug reactions and dosage as well as directions for use of the medicinal product, or consult a doctor or a pharmacist, as every drug may be hazardous to your health and life if used improperly.